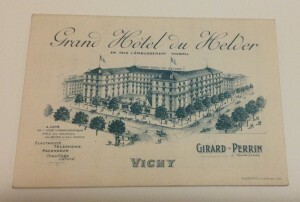 As you can see, the front cover and the left two panels from the recto advertise the hotel, its services, and its main features (location, views, proximity to the établissement thermal de Vichy, room types, languages spoken, etc.). 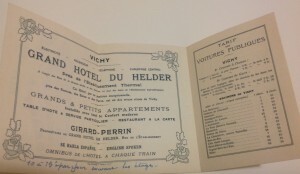 There is a two-panel table of fees for taxis to various destinations (aller-retour), drawn by one horse or two, and a one-panel table showing entrance fees for the casino and theatre. We had thought it would be an interesting document to encode, but thought twice when we realized how much the two-panel advertisement focused on form, and how little on content. Given the varying sizes of the fonts and the degree of white space, much of the page is dedicated to aesthetics. The tables contain more information, but we didn’t want to spend all of our time figuring out how to depict the information from the table. We opted, finally, to use a few pages of the Baedeker’s guide itself; its content is more substantial given how dense the text is (see Aneta’s post for pictures). Since it is a pocket-sized travel guide, Baedeker (the author and publisher) evidently wanted to cram as much information in as possible. While the hotel card remains an interesting artifact, we wanted something a little meatier for our project.